With all the roster changes through the draft system, and a few players coming up from the challenger series, there were a couple of close calls as season two started. First cab off the rank was the top dogs Melbourne Order up against one of the home teams, Sydney Roar. Both teams came out swinging and set the tone for the rest of the day. Don’t let the 4-1 score in favour of Order fool you, the games were close. While RoF looked a little shaky, Travis was a standout player for Order. A couple of mistakes couldn’t hide how strong he looked. His patient play and adaptability were on show as he gained the upper hand against Waz as their games went on. Eyes should remain on Damosk though, as his Balrog showed just how formidable it could be, beating RoF in the opening match for the season. It will be interesting to see how he develops as a player as the season continues. 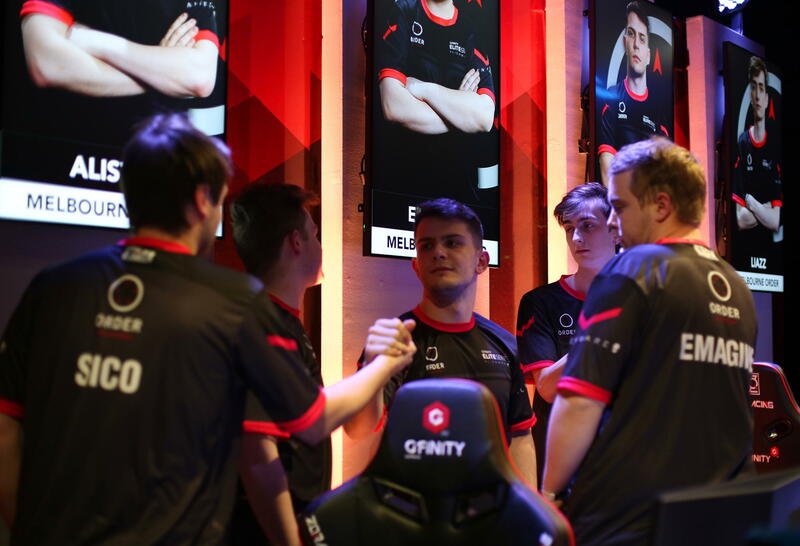 Next up was the closest Gfinity has to a grudge match, with the second home team, Sydney Chiefs, taking on the “Best from the West” in Perth Ground Zero. After losing the semi-finals as favourites last season, the Chiefs were keen to take revenge and assert themselves as the superior team once again. This turned out to be the closest match of the day, neither team willing to give an inch. In the end, it was the veteran squad of Chiefs that found victory over the relatively young guns of Ground Zero, 4-2. A 2-1 lead early on for the Perth team looked promising. Syo and Rupps took down the BKsama and Somniac in decently convincing fashion. The momentum could not be continued however, as Somniac played back-to-back in games three and four and found his footing in the latter. My, and the analyst’s, vote for MVP of the set goes to ZG for the Chiefs. Using Vega’s range and air pressure to keep Freeser’s Alex at bay, he started the season strong for the home team. Abusing Alex’s weak anti-air options and corner escape allowed him to take control of the match. His second match was even more impressive. Knowing that R. Mika is a bad matchup for Vega, as she can quickly get past his claw and has very good anti-airs, he switched it up and chose the Arabian sensation, Rashid. A character known for wild plays and unpredictability, Rashid proved to be the perfect counter to Mika. Going forward, BKsama will be looking to prove himself. A very close loss and a convincing win over Freeser showed the crowd what he was capable of if he keeps consistent as the season progresses. Rupps and Syo should not be discounted either. Ibuki and Mika are scary characters at the best of times and if you let them get momentum, both Syo and Rupps can dismantle their opponents. Moving into the final affair of the day, Brisbane Deceptors were looking to take down Melbourne Avant. There were rumours of a new character for Avant player AWildLlama, which proved to be true when he picked the newest character in the game, the charismatic and enigmatic G. He seemed unconfident in the character and fell to Pahnda and his, quite nutty, Ken. He did get a mirror match in his second outing though, defeating Caesura’s G still being a bit rough. It will be interesting to see how this character develops for him if he plans to stick with it as the season continues. There are some signs of greatness, but it seems a little more familiarity with the character and his matchups will help. RumoursofGhosts once again showed the audience why he is known as ‘Mr Gfinity’, dispatching Robbiesla and Pahnda to start another unbeaten run. Can he beat last seasons record and go 11-0? He’s aiming higher than that, wanting 14 or 15, effectively a clean sweep of the competition. Sourcing all local Brisbane talent for their team, the Deceptors have quite an interesting roster. Robbie, as the captain, will be looking to inspire his team with his quintessential Alex getup while Caesura should be the one to watch going forward. A self-proclaimed jack of all trades, Caesura has an extensive roster of characters which he isn’t afraid to show off. It also makes him really hard to prepare against, as players might prepare a secondary character to cover their main’s bad match-ups which can then lose to a surprise that Caesura pulls out at the last second. Overall, only three of each team’s players were on display this week, with a few more waiting in the wings to get their chance later on. From what we did see though, Avant looks to be the team at the top, with convincing performances all around. There are a couple of players to watch as the season progresses and hopefully their full potential can be realised.